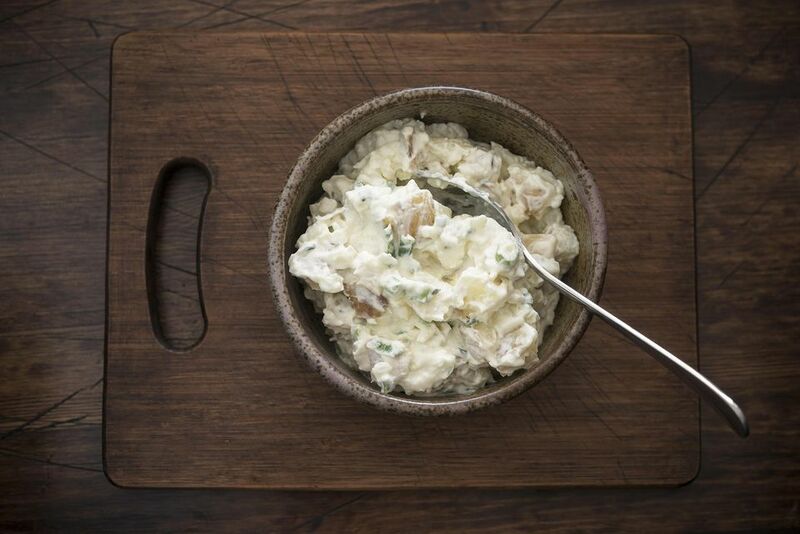 A tangy sour cream dressing turns a basic potato salad recipe into something special for your next summer cookout. This salad can be made with russet, red, or Yukon gold potatoes. A waxier potato such as the red potato will hold its shape better after being cooked. You may also enjoy using more than one kind of potato in the dish, perhaps even red, white, and blue baby potatoes. In a large bowl, combine the cooked and cubed potatoes, celery, and onions. In another bowl combine the green onions, mayonnaise, sour cream, mustard, sugar, cayenne, salt, and pepper. Add this dressing to the potatoes and toss to mix well. Taste and adjust the seasoning. Cover and refrigerate the potato salad for at least two hours before serving for best results. This potato salad doesn't contain eggs, so it is less risky (when made with commercial mayonnaise) to take to a potluck or picnic where it may be at room temperature for an hour or more. However, it should be kept refrigerated before your place it on the table. Leftovers should be promptly refrigerated and eaten within a day or two. By boiling your potatoes in salted water, you will be pre-seasoning them and you can use less added salt. Leave the skins on the potatoes if you prefer a more rustic potato salad. This also saves you time and the inevitable nicks from the knife or peeler. However, scrub the potatoes well before cooking. Remove any eyes from the potatoes as those contain chemicals that are undesirable. An easy method for cooking the potatoes is to cube your potatoes and cook them in a microwave-safe steamer in the microwave. You won't need to add any extra water and it is easy to test them for doneness. Potatoes will be less likely to crumble or be soggy when cooked in the microwave rather than boiled. Substitute Greek yogurt for the sour cream or the mayonnaise. The recipe will be good with reduced-fat or fat-free sour cream if you prefer. Add herbs to the potato salad such as fresh or dried dill or chopped fresh parsley. A tablespoon or more of dill relish, sweet pickle relish, or chopped pickled peppers can add more flavor.